It’s Christmas Eve morning on the track, and the fans are filling the stands to watch a special holiday race. Everything is going according to plan, but as the drivers begin to enter the track, a new car pulls up, ready to join the Christmas competition. It’s Santy Claus, and he’s prepared for anything with his tinsel-covered racecar and his red, fireproof suit. On his helmet are paintings of delicious fudge and bon bons that look good enough to eat. Santy’s traveled across the globe and back, all in one night, but this Christmas Eve, here on the track, old Saint Nick is in for a challenge. With peppermint candies and jingle bells rolling around the car, Santy must outrace the best drivers in the league. Colorful illustrations bring the story to life and add to the excitement as Santy must overcome flying debris to win this race. 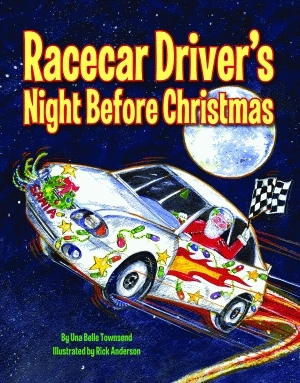 Exciting and hilarious, Racecar Night Before Christmas is a perfect addition to the Night Before Christmas Series and any holiday collection. Una Belle Townsend has been an elementary-school teacher for nearly twenty years. She graduated from East Texas Baptist College and earned a master’s degree in elementary education at Stephen F. Austin State University. She has received many local honors for her short stories and poetry and is the author of Grady’s in the Silo, published by Pelican. Townsend has lived in Yukon, Oklahoma, for more than twenty-five years. Rick Anderson is an award-winning artist and illustrator. He holds a master’s degree in art education from Delta State University and is the illustrator of several children’s books. Anderson worked twenty-five years as an art teacher and has won more than 150 awards in local, regional, and national exhibitions. He lives with his family in Clinton, Mississippi.